My head’s been swirling with a stew of questions, all wondering about contemporary French cuisine. Since I’ve been reading up on Julia Child this year, I’ve been vicariously living in post-WWII France, salivating over elaborate descriptions of the food and wine she discovered (and would soon share with her fellow Americans) in the 1950s. Thanks in part to her memoir (My Life in France) and her two-volume cookbook (Mastering the Art of French Cooking), we have a pretty decent picture of what traditional French fair is all about- ingredients, preparation methods, and so forth. We also have images of what food shopping in Paris was like in the 1950s, what students at the Cordon Bleu were learning and what restaurants were serving. What got me thinking was simply the fact that I don’t live in quite the same Paris as Julia Child did. While many traditions and ways of life in France have remained, others (naturally) have changed. The marché des Halles (the vast market in the center of Paris that Emile Zola referred to as “le ventre de Paris” and where Julia Child did much of her shopping), for example, has been moved to the southern outskirts of the city. Since 1969 culinary professionals have instead been going to Rungis to buy their fresh products. This is only one of the many evolutions in the French culinary world since Julia’s time. I wonder what other changes have taken place and what effect they’ve had on “French cuisine.” Whether talking about how it’s bought, how it’s prepared, how it’s eaten or how it’s appreciated, I also wonder what culinary traditions have persisted. This brings me to my big question: What is French cuisine, today? It seems to be a fad to write about the decline of anything French nowadays. Take, for example, American journalists Michael Steinberger (well-known for his writing on wine) and Donald Morrison (long-time writer for TIME magazine). The book titles alone get my blood boiling: Au Revoir to All That: The Rise and Fall of French Cuisine and the more recent Au Revoir to All That: Food, Wine and the end of France are Steinbergers contributions. I, unfortunately, haven’t been able to get my hands on either copy yet, so can’t make any judgments. I’m hoping he has some interesting points to make- the titles, however, make me wary and hope they’re nothing like Morrison’s. This author’s contested (by people over here at least) 2007 article, “In Search of Lost Time,” followed by his book The Death of French Culture, left me wanting to scream over the Atlantic: France is still alive! I thought it was ironic- and slightly amusing- that Morrison was promoting his book on French soil just after Le Clezio had been awarded the Nobel Prize for literature, for example. All of this talk about the “end of France” obviously puts me on the defensive. My hunch is that we haven’t been keeping up on what France really is today. What traditions still reign? What transformations have taken place? Do today’s cultural, economic and environmental contexts play a role? Think, for example, of citizens’ increasing awareness of environmental sustainability. Think of the plethora of cultures co-existing in contemporary France. Surely foreign cultures must have an influence on everyday cooking and culinary trends. Have peoples’ eating habits changed? Have their cooking habits changed? Today, I don’t have the answers to these questions, but I do know that, whether the rest of the world notices it or not, France is alive- and “the French” are eating- at least the ones I’ve been around for the last five years. I’ve been eating, too- and I’ve been eating well. In other words, I’m launching a quest to find out what French cuisine is all about, today. 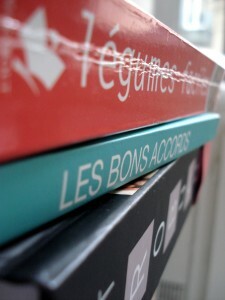 This entry was posted in Everyday Life in Paris and tagged books. Bookmark the permalink. CD, answer me this:How did we WIN "WW2"? History has PROVEN that to win a war one HAS TO level the enemy. The USA knew that — ONCE. Now it's even WORSE! Now we have an Admn that bends-over-backwards to just BEND OVER for muslim terrorists. It's deplorable, at the very least!